The discovery site is near the proposed Tule Springs Fossil Beds National Monument, a fossil-rich area known for its diversity and abundance of Ice Age animal remains. Scientists estimate the fossil to be 10,000 to 15,000 years old during the Late Pleistocene period. "Dire wolves are known to have lived in almost all of North America south of Canada, but their historical presence in Nevada has been absent until now," said Bonde, a UNLV geology professor. He was a Ph.D. student at the university when he discovered the bone. "The Tule Springs area has turned up many species, but it's exciting to fill in another part of the map for this animal and reveal a bit more about the Ice Age ecosystem in Southern Nevada." Foot bones of the extinct dire wolf are difficult to distinguish from those of the gray wolf. Researchers conclude bone is likely from a dire wolf because of the abundance of dire wolf fossils―and scarcity of gray wolf fossils―in similar-aged excavation sites throughout the Southwest. Fossil remains of dire wolves are abundant in the La Brea tar pits and have been found in other Southwestern states. Many of the same species of Ice Age animals found at La Brea have also been recovered in the Las Vegas Valley, including Columbian mammoths, camels, horses, bison, and ground sloths. "This discovery helps flesh out Southern Nevada's Pleistocene ecosystem and shows that there are still important discoveries to be made in the Upper Las Vegas Wash," said UNLV geology professor Steve Rowland, a collaborator with Bonde on the study of local Ice Age fossils. "To understand why certain species became extinct and others did not, we need to learn as much as possible about predatory habits and which species were especially sensitive to changes in the environment." According to Rowland, Tule Springs was a spring-fed, swampy area during periods of the Late Pleistocene, an ideal spot for plant-eating animals and their carnivorous predators. The recent discoveries come exactly 50 years after scientists conducted a 'big dig' at Tule Springs, revealing the site to be rich with Ice Age fossils. "Tule Springs likely had the highest density of large animals in the area during the Late Pleistocene, and the marshy environment was very good for preserving at least some of the bones and teeth of animals that died there," said Rowland. "In the 50 years since the 'big dig,' the scientists have confirmed that humans interacted with Ice Age animals. We now have a new list of questions about life and death in the Pleistocene, and a new tool kit of research techniques to help us get the answers." The identity of the find was confirmed by Xiaoming Wang of the Los Angeles County Museum of Natural History, an expert on extinct species of the dog family. Bonde has been surveying the Tule Springs area since 2007, and he and a group of UNLV undergraduate studentss are prospecting for more fossils. The center of the original 'big dig' is on the same parcel of land where Bonde discovered the wolf fossil. 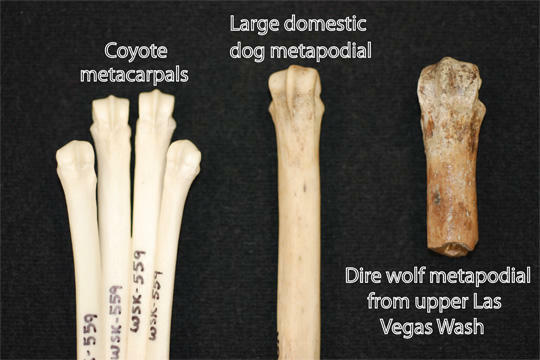 The dire wolf bone, in addition to other bones collected by UNLV researchers, are cataloged, studied, and stored at UNLV.